The Borgias get up to all sorts of shady dealings in Renaissance Italy, especially Lucretia who is sent out to kill a man, but falls in love with him. A disaster for all concerned, even Ray Milland who refused to do it and was suspended by the studio. Director Mitchell Leisen loathed the script and concentrated on the flamboyant decor - he was originally an art director, anyway - though it should have been in colour. 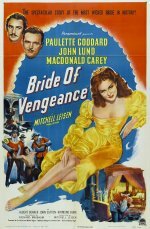 So bad were the reviews, and so thin was the box-office, that Paramount sacked its contract star, Paulette Goddard, who plays Lucretia. It was produced by future 007 screenwriter Richard Maibaum.